Hello again. Boy, don't those weeks fly by? I want to thank you for the encouraging comments you make each week and especially this past week. I'm glad so many are being blessed by linking here. We have such an awesome God. I never would have dreamed a few years ago that I would be sitting here at the computer every Thursday night scheduling a post to go on Friday morning that would be a blessing to so many people. I really do like it that posts can be done ahead of time and go on automatically at whatever day or time you want. Like you, I never dreamed I would be on the path I walk today - as the wife of a Messianic Rabbi. Your blog is truly a blessing to me, and to many. You are a blessing to us too, Gail. Thank you for your participation. Wendy @ E1A (formerly ECTaS)! I thank the Lord for your faithfulness, dear Charlotte, to set up this linky every week. Like you, I also want to write in advance, esp. when the inspiration strikes (and that is at any hour, even when I am about to sleep! ), I don't want to postpone it for the outpouring of spontaneous words only comes during those Spirit-inspired moments :D! Hi Charlotte! Bless you and thank you for hosting again this week! A turbulent couple of weeks with natural disasters across the country - how we need that good Word! Thank you for setting this up again. I needed to focus on the Word and this helped! Hi Charlotte - you aren't kidding about fast-moving time. I went to Walmart yesterday and they ALREADY are putting up "Back to School" supplies! Yikes. Those greased roller skates called my day just keep zooming. :) But Praise GOD that He keeps me going with His wonderful and comforting Bible verses, praise music, and love - no matter what - and I know you feel the same. Talk about sweet joy! Have a blessed and beautiful week. Oh, Charlotte, you have hit a nerve with this one. I feel a new resolve this morning, one I have not felt for a long time. And you confirm it with your verse. Thank you. Have a lovely Sunday, Charlotte. Thanks so much for hosting. May you have a blessed week in Him! Thank you Charlotte for being so consistent and always being here. It has been a while since I came over. But I am anxious to share. Blessings to all who enter here. 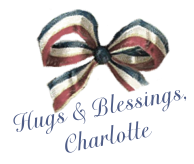 Charlotte - just wanted to say thank you for not only graciously hosting this link-up each week, but also trying to visit as many of the posts as you can! Your comments always encourage me. Thank you! !